Anyone who works in videography (or photography, for that matter) knows that organization is key. When you’re dealing with thousands of files—many of which are very similar—if you don’t have a system in place, you’re going to end up wasting time just trying to track down the right clips, which means even more time required on work that is already really time consuming. In some cases, a lack of organization could even lead to losing or misplacing (which eventually amounts to losing!) crucial footage that you could have used for a project. So how do you stay organized? Here are seven tips and tricks I’ve learned after years of working in aerial cinematography. These are the editing hacks I wish someone had shared with me when I first got started with post-production work on my own aerial video footage. They’ve saved me dozens of hours, and kept my hair from turning prematurely grey. Here are my seven tips for keeping your drone footage organized. After filming, give your file names an event name and date in them. I like to keep the name the camera generated in there too. (i.e., if my drone made a file called “DJI_0458.mov” I’ll rename it to “New_York_Sunset_03042017_DJI_0458.mov”). That way when I’m looking through lists of files I can quickly tell what was filmed and the date. Consider making a spreadsheet of the all the files in a particular event folder that lists each file name along with columns for descriptions of video, keywords, etc . . . Really anything you want to track. This could include things like the aircraft and camera the footage was filmed with, frame rate, resolution, etc. All of Cinematic Aerospace’s footage is organized in a database system now, but we originally used a spreadsheet to organize our footage. You can download my shot log PDF here. Don’t be afraid to delete footage on the spot that you know is no good. I always review each clip as it’s coming off the memory cards, and if I know I won’t ever use it (because I have a very similar shot that is better, or the shot is messed up for some reason) I will not even bother transferring it to storage. This practice saves storage space, it saves time when you’re going through your files later, and it makes keywording and managing the good files easier. Consider an asset management platform or software if you really want to get fancy with organizing your footage, or you’ll wind up gathering a ton of it over time. Sometimes you have so much footage it becomes very hard to track it all manually with spreadsheets. An actual software database can help tremendously if you can afford it. When editing, if your footage will always be “online” (meaning the hard drive is connected and accessible all the time) in their original location, “link” to the files in your editing software instead of copying them into the project folder or file. This can save you space, and helps you make sure you always know where the originals exist. While it may seem obvious and not so much like a big tip . . . BACKUP YOUR FILES. DO NOT learn the hard way what it’s like to lose your footage. Losing footage happens to the best of us, and it always seems to be that perfect, magical moment you happened to capture that gets corrupted or deleted somehow. Buy a decent backup hard drive and save all of your files to it. Avoiding the pain of losing good footage is well worth the price. 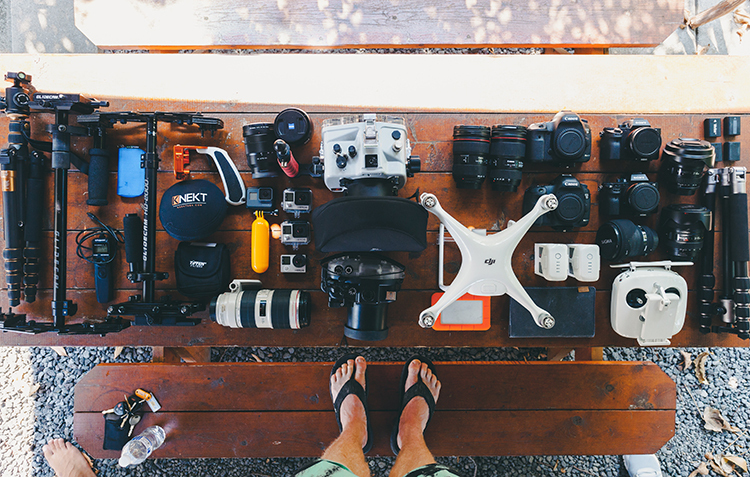 We hope you found these tips useful, and that they help you with organizing your drone footage.